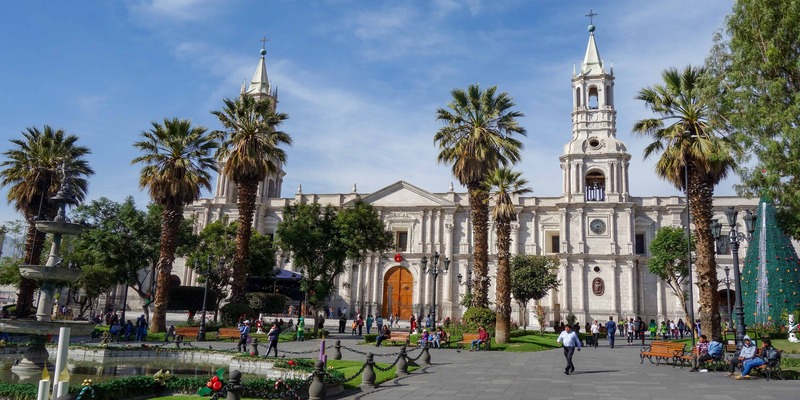 Also called the Ciudad Blanca, the White City, Arequipa is one of Peru’s most beautiful cities. Its city centre is made up of colonial buildings, with a lively plaza and a long pedestrian zone. From various spots in the city, you can see volcanoes rising high into the sky. 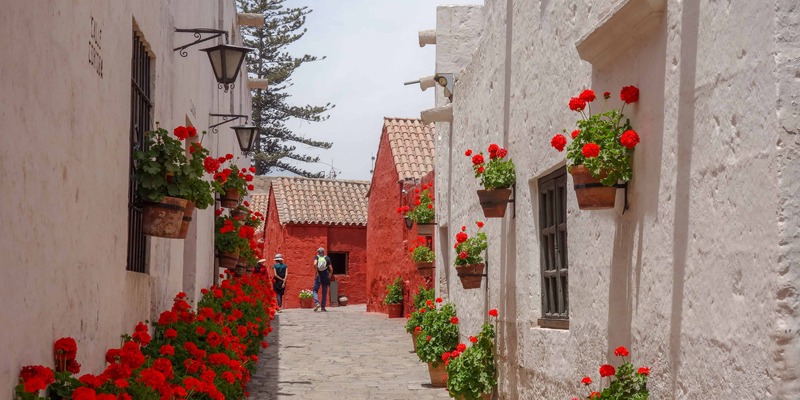 With more museums than one can possibly visit, vibrant markets and the Colca Canyon nearby, Arequipa should be on every Peru itinerary. It is easy to stay busy for a couple of days here. If you’re looking for suggestions on what to do, keep reading. If you have been traveling around South America for a while, you will be tired of monasteries. But no matter how many of them you have seen, you should still visit the convent of Santa Catalina. This huge complex is unlike anything I have ever seen before, consisting of streets, houses and even a viewpoint from which to spot the nearby volcanoes. Nuns had their own apartments inside this monastery, complete with living room, kitchen, pretty furniture and, of course, a small room for their servants. Only girls from rich families were allowed to join. These days, there are about 20 nuns left that finance the monastery by selling handicrafts and baked goods. The pecan pie, sold in the cafe inside the convent, is delicious! Out of all the museums in Arequipa, this is the one you should not miss. The museum is dedicated to Juliana, an Inca girl that was sacrified to the gods more than 500 years ago. She died on top of one of the nearby volcanoes, through a violent blow on her head, and was buried up there until an explorer found her not long ago. For the Incas, the mountains represented gods. If they were upset, volcanoes errupted and earthquakes killed hundreds of people. To calm them down, one had to give sacrifices – and what could be more meaningful than the sacrifice of a child? These days, scientists find more and more graves on mountaintops. The Museo Santuarios Andinos explains their stories. You will learn about the Chosen Ones, their stories and believes and get a unique insight into the Inca culture. 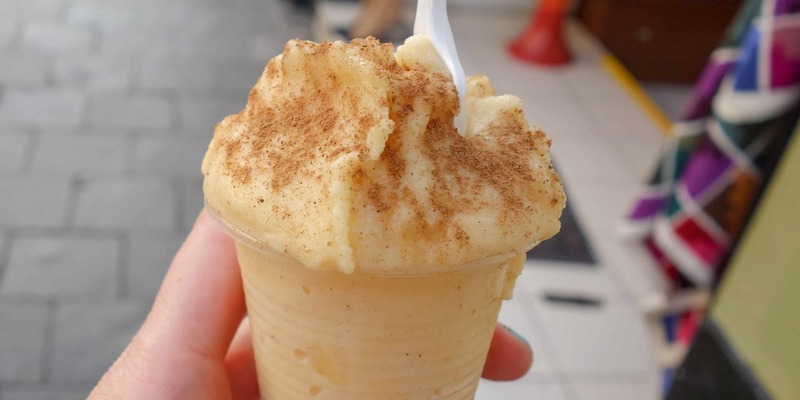 If you speak Spanish, you will know that I just told you to try cheese ice cream. But don’t worry, queso helado does not taste like cheese and it is not made of cheese either. It tastes like coconut, cinnamon and cloves. You can buy it from street vendors all over the city and it is a snack you should definitely try. If you haven’t seen any alpacas yet, the Alpaca World is a great place to get close to them. Here, you cannot only pet living alpacas, you can also touch their wool and discover the long process of turning it into a colourful scarf. 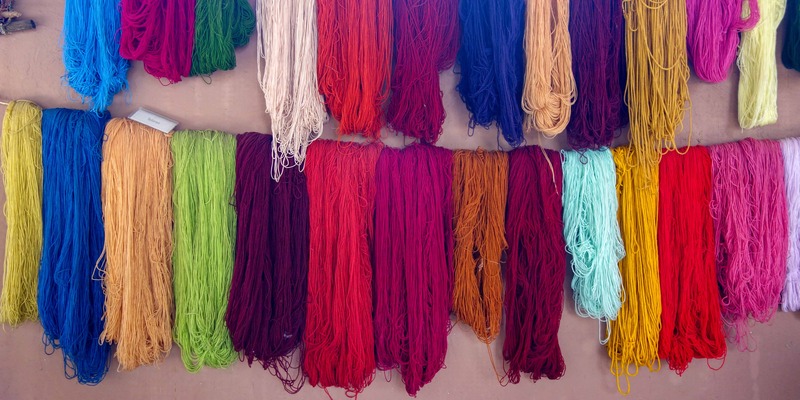 When we went there, we could even watch two women weaving traditional Andean textiles. Afterwards, you can browse through their giant shop. Look at the pieces behind glass. They are made from vicuna, a wool far more valuable than alpaca. The scarf alone costs 1000 US $. Arequipa’s cathedral is huge. It takes up one side of the main plaza. You can either visit it for free when it’s open to the public (inquire about opening hours – it was open in the evening when we walked by) or see the museum. The museum includes entrance to the cathedral, to the gold museum and to the towers. You have to take a guided tour (which is not included in the entrance fee), but it is worth it for the view of the volcanoes from the rooftop. Plus, the gold museum holds many treasures unlike anything I’ve ever seen before. The Mercado San Camilo, located a short walk from the main square, is a great place to have lunch. 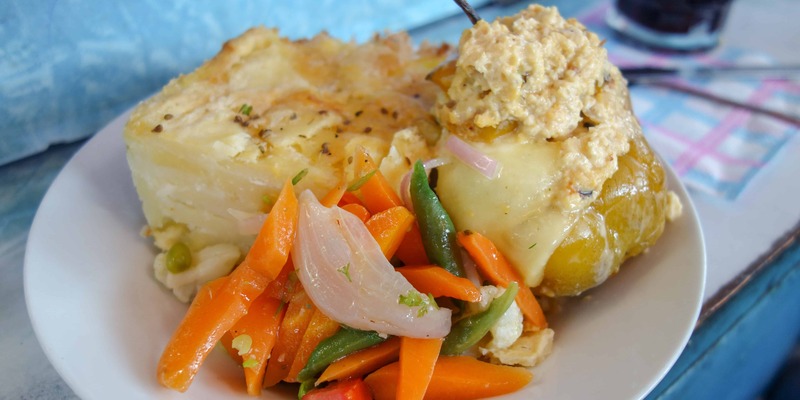 Local specialties include ceviche (raw, marinated fish), rocoto relleno (stuffed peppers) and escabeche de pollo (chicken served on a salad of vegetables). Afterwards, walk through the fruit section and eat grenadillas for dessert, or find the juice ladies who will prepare fresh shakes for you. Just like the cathedral, the Iglesia de la Compañia is located next to the main square. But that’s where the similarities end. The Iglesia de la Compañia is a lot smaller and its decorations are a lot more golden. We came here in December and saw a very interesting Nativity Scene, with figures representing all the different climates in Peru. Hidden in there, we found tucans, flamingos, llamas and even two cars stuck in sand dunes. Hatunpa is my favourite restaurant in Arequipa. 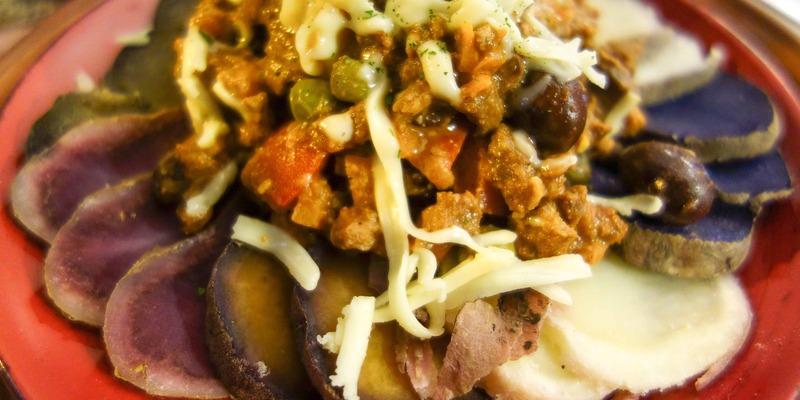 It specialises in potatoes that they serve with various toppings. You can either try three different kinds of potatoes or seven different ones. We got samples of all seven. They do not only look different (from yellow to orange and purple) but they all taste different, too. Seven is only a tiny number, compared to how many different sorts of potatoes exist in Peru, but it is a great introduction to how tasty this vegetable can be. And if you’re still hungry afterwards, you can get dessert. The Colca Canyon is located close to Arequipa and the best option to visit it is by doing a hike. You have two options. You can either do a two-day or a three-day hike. In both cases, the distance you have to walk is the same, but for the three-day hike, you only walk for a couple of hours before lunch and are then free for the rest of the day. If you do it in two days, you will be busy all day long on your first day. The Colca Canyon is famous for its condors. While you will stop at a viewpoint to spot them, don’t expect to see them. I didn’t. It was still a great hike. We came past villages so remote they can only be reached on foot or by mule. We walked through orchards on Inca terraces and relaxed by a pool on our last evening. 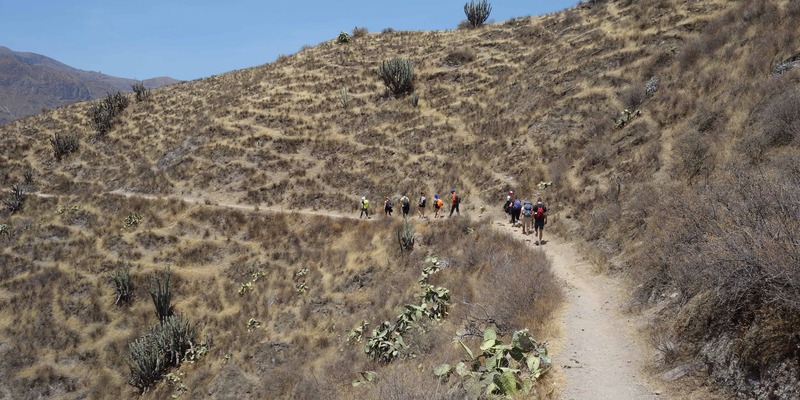 While you can hike the Colca Canyon by yourself, it is often far cheaper to join a guided tour. Shop around. The tours are all the same, but prices vary greatly from one agency to another. Sorry guys. This is a suggestion for girls only (although I’m sure the Peruvian ladies would love to do your nails if you showed up in one of their shops). Up until Arequipa, I had never had a manicure. When I was a student, I couldn’t afford it. When I started working, my job didn’t allow me to put nail polish onto my finger nails so there was no point in getting one. But when we arrived in Arequipa and went past all the manicure shops, we realised that this was our chance. I spent around seven dollars on having my nails cleaned and painted with a very complex design. If you go for simpler layouts, it’s even cheaper (my friend spent around four dollars). It’s a fun way to spend one or two hours with a friend and you will have beautiful nails for at least a week.